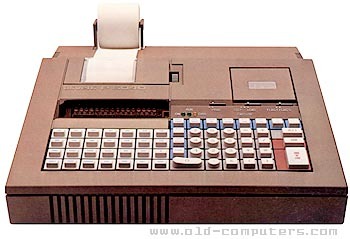 Although the P6040 was very like a calculator, it was a real computer featuring 16 KB ROM, 2 KB RAM and a tiny BASIC programming language. A three position selector allowed to enter a BASIC program (LOAD position), execute (EXECUTE) or debug by running one instruction at a time (STEP). Sadly, out of the 2 KB of available RAM, only one was available for BASIC program and variables. Hopefully, an optional 2 KB RAM extension was available. Programs could be listed or executed using the red diode display or the built-in alphanumeric printer. They was saved on Olivetti specific 2.5" 3 KB mylar minidiscs through the built in disc drive. Three versions of the P-6040 were sold. The first allowed programs to be created, edited and executed; the second only allowed programs to be read from the minidisc and executed; the third, stangely, allowed programs to be created and saved but not executed. SIZE / WEIGHT 36 (W) x 40.6 (D) x 11.6 (H) cm. / 7.8 kg. see more Olivetti P6040 Ebay auctions !